Rioja Reserva, Pandering to the Lowest Common Denominator? It is a fashion, of late, to praise ‘modern’ winemaking and its techniques. Up until very recently – if it isn’t still going on – the argument held that because US wine guru Robert Parker liked a certain style of wine, most wines were made to this standard (Parker wielded great power on behalf of the consumer, so winemakers made wines to please his palate and therefore sold more). Parkerisation, modernisation, globalisation and standardisation of wines became synonyms. Parker liked new oak and lots of fruit. So wines were made with new oak and lots of fruit. And it was the fashion for people in the wine world to rail against this. 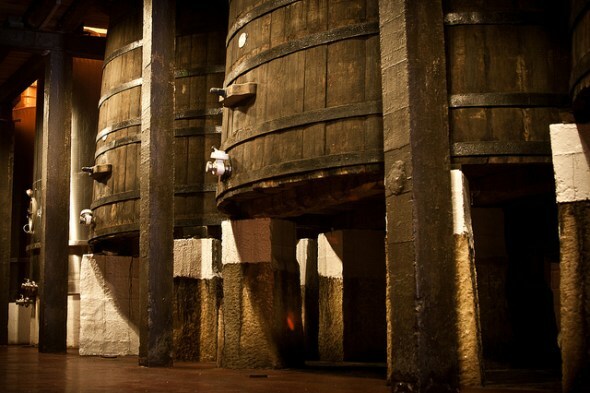 But now, while in many areas ideas about what good wine should be have moved on (see, for example, the proponents of Natural Wines), it has become a bit boring to attack ‘modern’ winemaking techniques. So a lot of us have become apologists – we are unwilling to defuse the Parkerised fruit bombs – and we even let them go off in a controlled environment. Even I have done this – my review of El Puntido, on these very pages, would be a prime example. But what is the point of having an appellation – a strict list of proceedures to be religiously adhered to – if it isn’t to stop this modernisation? Wine, like language, changes.Of course, though, we accept that the person about to drink a Beaujolais Village or a Bordeaux Grand Cru or – as in this case – a Rioja Reserva, should be able to define a few aspects of flavour in these wines. It’s why you wont find Cabernet Sauvignon in Burgundy or Bobal in Rioja or Tempranillo in the Veneto. But let’s return to new, highly toasted oak? Should that be in Rioja Reserva? As far as I’m concerned, it shouldn’t – or at least the people in charge of setting these appellation standards should ensure it’s kept to a minimum. I understand why consumers like a lot of vanillin and mocha in their wines – even I’m not immune to their charms – but you don’t really want to see your best friend debasing herself in order to be popular. So why cannot a decent Rioja Reserva 2004, namely that from Bodegas Muriel, avoid such an obvious use of new, toasty oak? Is it to help the consumer on his or her voyage of discovery? Is this how we lure people in to the world of wine: use a lot of friendly trickery before we give them the really dry stuff? I don’t think so. Sure, you can buy Bodegas Muriel’s Reserva in the UK for £9.99 (at the Co-op, if you want to check up on me), but why is it the bosses at the bodega and the boffins at the wine department in the Co-op have so little faith in their customer? The problem isn’t just that the wine is toasted and mocha-like, it’s that it’s hiding some really decent fruit (yes, I found it in the end). Should we simply always pander to the lowest common denominator? Is this a vision of the future of wines you can get on the shop shelf? Is this a worrying portent that all those anti-Parkerites were right to be scared of a globalisation of wine? Too difficult to tell from just one bottle. I hope it’s not symptomatic. Perhaps the lunar phase is muting the rest of the fruit or bringing the toasted, oaky notes to the fore but a seven year-old wine – a Rioja Reserva to boot – should not smell and taste like a toasted mocha bomb. In a way, it tasted nice (a bit like a caramelly coffee ice-cream) and there is some really lovely fruit in there – all raspberries and red berries with a lovely, fresh, bright finish that – I must admit – sits nicely with the tannins. But why so much toasty oak? It would have been even more enjoyable without.